All images by Michel Leroy. Used with permission. “It took months of experimenting with different techniques and combinations of digital and film equipment to achieve this unique in-camera look,” photographer Michel Leroy tells us about his series Alchemy. 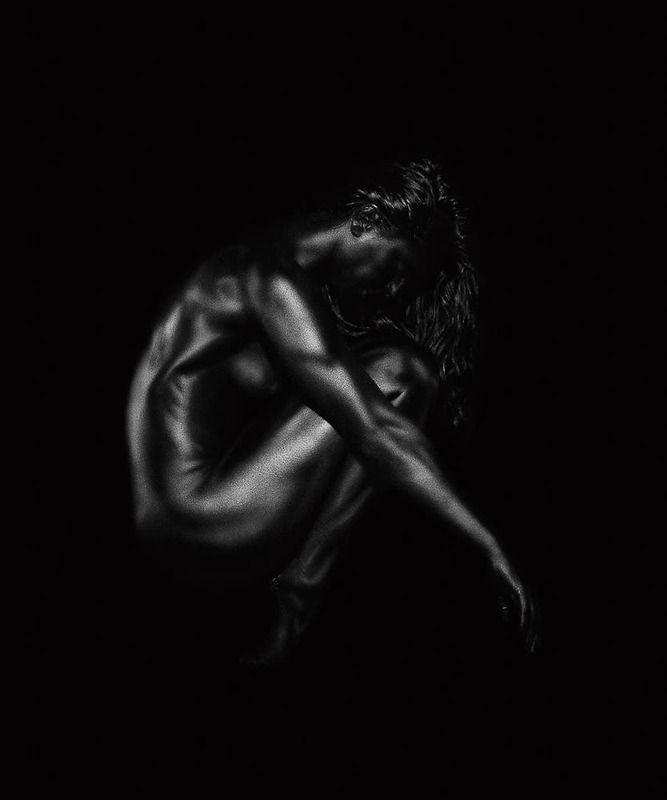 “It is the combination of gear and lighting that gives the skin the unique dark metallic look not body paint or Photoshop.” Tonight, Michel is unveiling the project to the public at a gallery opening in NYC. Michel is a commercial photographer these days, after a previous life as a photojournalist. So when it came to Alchemy, Michel was all about creating a series of images that helped him with his experiments. He wanted to explore a single idea in depth. So he went about collaborating with a number of athletes and experimenting to get this look all in-camera with no photoshop. Michel: I’ve been into photography since high school when I fell in love with the language of the visual storytelling. I followed that up with a BFA in Photography from the University of Dayton and worked as a student for the UD Public Relations department and the Dayton Daily News to help pay my way through college. 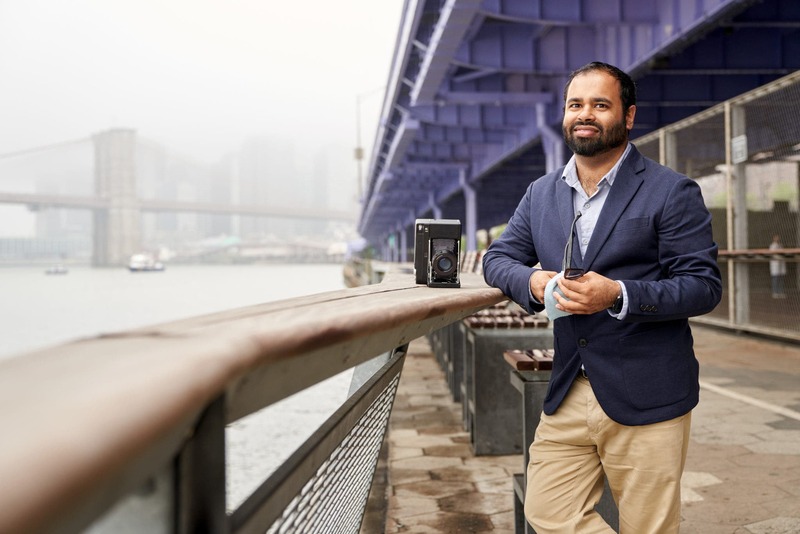 Phoblographer: What made you want to get into commercial portraiture? Michel: I am a people person, I always have been. After graduating I moved to New York City because this town rewards talent and initiative more than any other place I know. I made cold calls, wrote letters and scheduled meetings until I got assisting gigs. Living in NYC and being relentless allowed me to assist legendary photographers and learn everything I could about commercial photography at the highest level. I worked my way up from coffee-runner to 1st assistant and had the opportunity to travel the globe on assignments photographing the people that define our time: from A-listers in Los Angeles to industrialists in Shanghai, Nobel laureates in Paris, professional athletes in Tokyo and former Presidents George W. Bush and Bill Clinton. When I stopped assisting I had a global network of colleagues and peers that have lasted my entire professional life. Phoblographer: This project is called Alchemy. What inspired the name? Michel: The name is based on the idea of transforming or combining elements into something new. I have photographed so many athletes and know how they move with a body-awareness and confidence that transcends the average. I also wanted to create body-positive images that are inclusive of size and diversity, images that unite and celebrate a range of athletes. The result is something magical in a way that transcends photography and looks sculptural, Alchemy seemed perfect. Phoblographer: For Alchemy, you specifically went for black and white. Why? Michel: I love black and white and have since I started shooting. My commercial portfolio is filled with B&W and I think it reveals texture and detail that captivates the viewer. 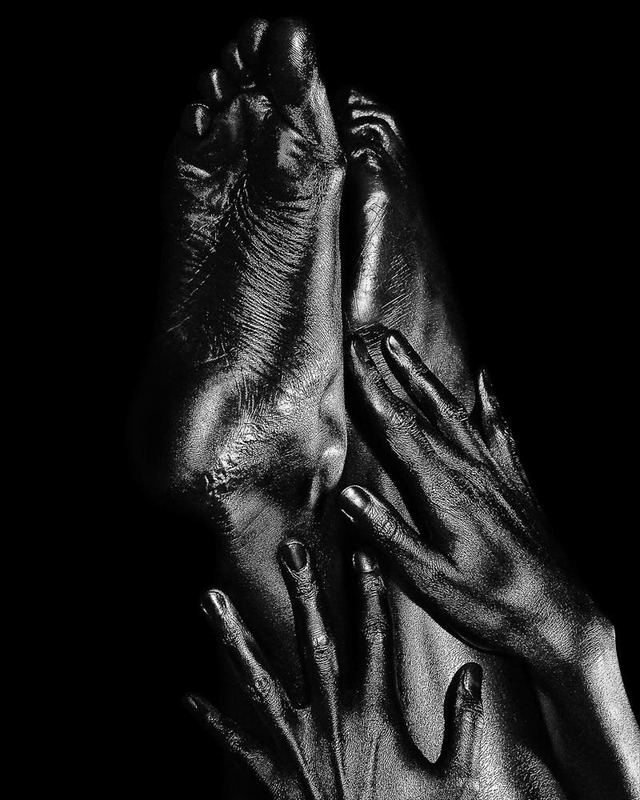 The Alchemy series strips the image to its bare elements – light and shadow, form and gesture. Phoblographer: Where did the inspiration for this series come from and what do you feel like you’re expressing? 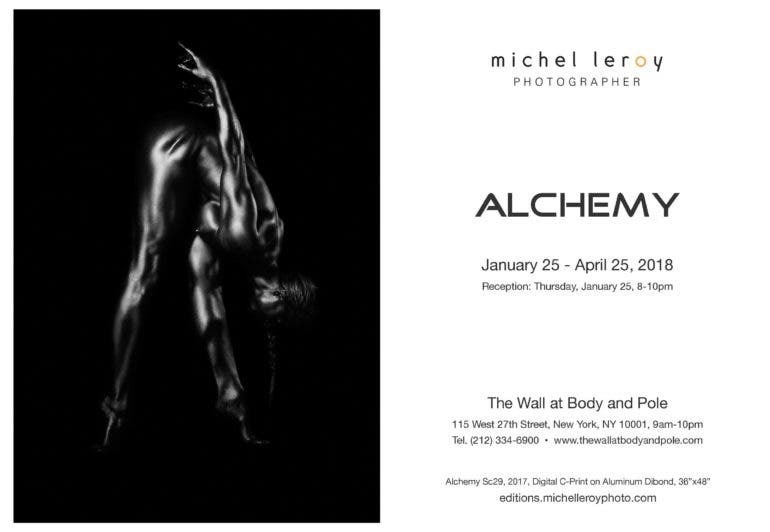 Michel: Inspiration for the Alchemy series came from my personal desire to create a body of work that explores a single idea in great depth. My commercial work results in amazing images but rarely do I get to keep exploring a subject for more than a day or a week at most. I’ve been shooting this series for over a year and the creative challenge of pushing myself to innovate each time I shoot within a narrow set of self-imposed parameters is exhilarating. Phoblographer: This project features athletes in a whole lot of wide, full body images but then it gets pretty close in focusing on abstract parts. When it came to the creative thought process, were you more motivated by trying to create shapes in a playful way or really just focusing in on the parts of a whole? How do you feel your creative mind differed when shooting? Michel: We are saturated with images every moment, from advertising to Instagram, we consume thousands of images a day. To engage a savvy viewer you have to keep their gaze through images that inspire, engage and challenge. 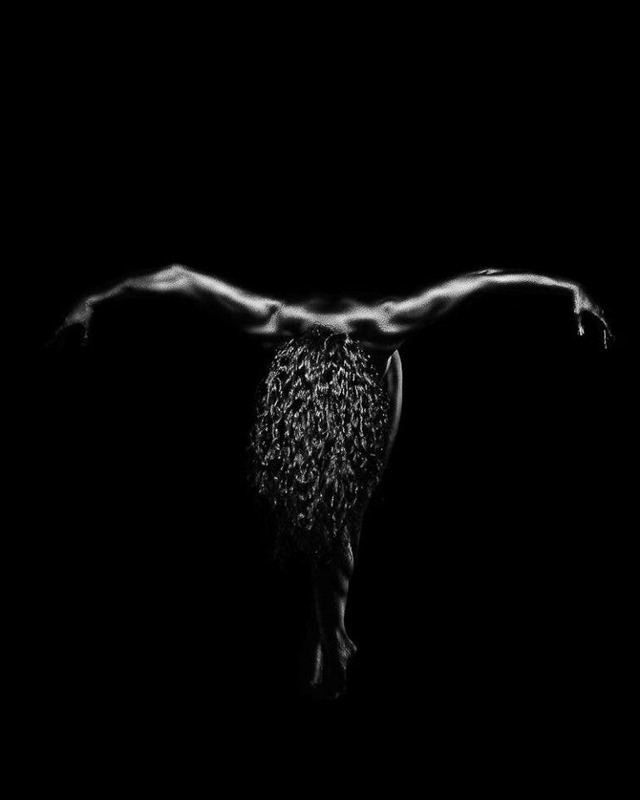 With the wider shots in the series I am creating moments of sculptural balance, anticipation and strength that imply motion and activate the figure. The details challenge your assumptions because you know it is a body but you aren’t sure if it’s a knee or shoulder. All of the images reveal a level of clarity and detail beyond the casual glance. Phoblographer: What’s it like communicating ideas to athletes who have no idea what you want? Did you ever sketch these out or storyboard? I mean, how exactly do you tell an athlete that you want them to do one thing or another? Michel: Directing professional athletes isn’t as hard as you might guess. As I mentioned before, athletes have a body-awareness that gives them natural poise and physical grace. I demonstrate what I want, a lunge, a leap or inversion, they laugh out loud then they show me how it should look. I also shoot tethered and have a 27” monitor on set so subjects can see exactly what we just shot. Athletes look at the images and say things like “I need to engage my lats and depress my scapulae”. It’s like when dancers practice in front of a mirror. This series is a collaboration and sharing the images with the athletes as I shoot allows us to explore the pose and create better images together. Phoblographer: How many sessions were done for this series and how long did it take? Do you feel like there were times when you were more productive vs less? Michel: I’ve been working on this project discreetly for almost a year and I’ve photographed over 30 athletes already. It’s not that I was hiding anything I just thought if you saw the images on Instagram every few weeks it wouldn’t be as powerful as seeing a whole series. The 3×4 foot prints are mesmerizing, you can get lost exploring the details. We typically shoot for 2-3 hours with a solid hour of warmup and stretching. If I can’t get an amazing shot of a professional athlete in a few hours of dedicated shooting that’s my problem. I’m normally given minutes or maybe a half hour at most with a subject when on assignment. 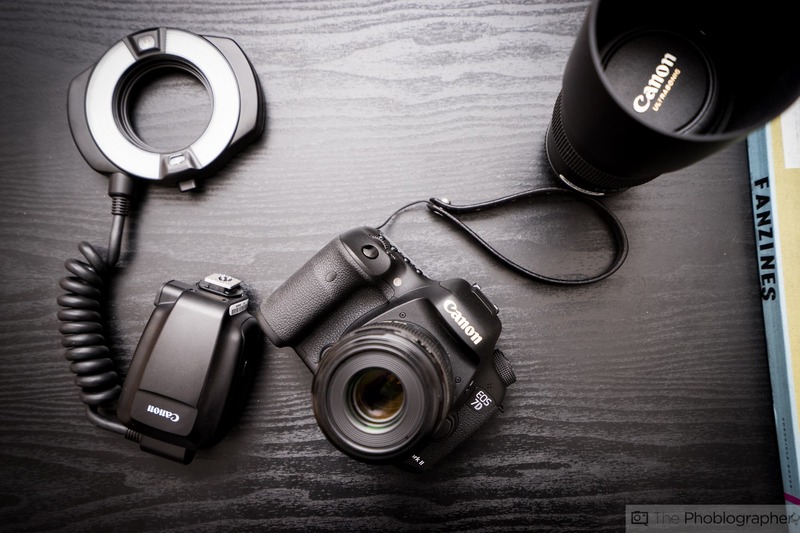 Phoblographer: Can you tell us about the gear you used? How much Photoshop and retouching went into this? Michel: It took months of experimenting with different techniques and combinations of digital and film equipment to achieve this unique in-camera look. It is the combination of gear and lighting that gives the skin the unique dark metallic look not body paint or Photoshop. The technique is a labour-intensive process that forces me to be very deliberate and accurate when I shoot. Because I am using studio strobes I can capture fast action but the process itself is very slow. I’m sure someone will post a YouTube video by the end of the week with a tutorial on how to achieve this look with a few clicks in Photoshop but for me it’s important to show the athletes what we are creating as we shoot, it motivates and inspires them because they can see the amazing results live. Since the process is digital I can then open the RAW files in Photoshop and emphasize the highlights or darken the shadows to guide the eye across the body. I also find the process of editing twice really helps because sometimes I anchor onto a pose or single image when we are shooting only to discover other, better images, when I edit again a few days later. That is the luxury of a personal project, it gives you the creative time to really explore. Phoblographer: When you were shooting this series, what were you thinking about as the final result? The prints? An online gallery? A book? What are you going to do with this project? Michel: The genesis of the project was a creative exploration for me as an artist and has grown into a series I am really proud to share. I kept the project off social because as soon as I worked out the technique (which took months) I knew this was something unique that would benefit from large scale prints. Since the show was announced the social engagement and interest has exploded. This is an ongoing project for me, I have new shoots scheduled in the weeks and months ahead. I plan to keep exhibiting the work as the series grows, and who knows, maybe a velvety black and white coffee table book. We’ll see.